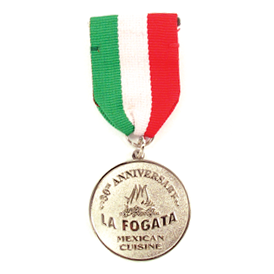 Our medallions are handcrafted by the finest artists to bring you the highest quality and detail in the industry. Steel medallion with 4 soft enamel colors or die struck two-tone with texture in recessed areas. Choice of antique brass or nickel plating. Choice of 7/8" ribbon or ribbon drape with pin. Individual poly bag or bubble wrap. 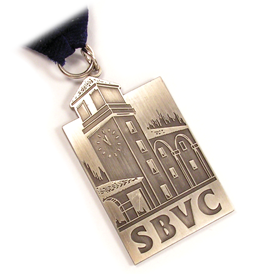 For gold, antique gold or silver finish add 20% to the per piece price. For two color plating add 40% to the per piece price. Add 0.28 (A) per enamel color fill. 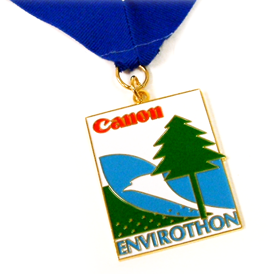 Add 40% to the per piece price for two color plating. Add 0.16 (A) per side for an epoxy dome. Extra wide ribbon, 1-3/8" wide, add 0.10 (A) per piece. Full color printed inserts are available. Please call for pricing. For 3-D coin pricing refer to coin section. 50.00 (G) plus die charge. 50.00 (G) refunded with an order of 500 pieces or more. Overnight shipping charges may apply. Add 2 weeks to delivery time. 4 weeks after artwork or sample approval.